Hafal Gwynedd helps people with serious mental illness and their families to work towards recovery. All our services are underpinned by Hafal’s Recovery Programme which empowers clients and families to take control of their lives and achieve recovery. Tŷ Adferiad is a newly-refurbished, purpose-designed property based in Porthmadog – right on the edge of Snowdonia and the North Wales coast. During three-day recovery breaks structured morning sessions are tailored to meet the needs of groups and individuals, focusing on Care and Treatment Planning and effective goal setting. 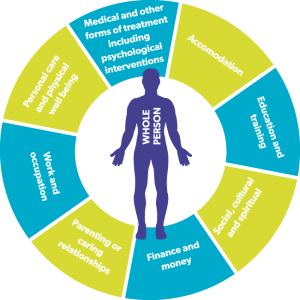 Visitors fill out a personal plan which gets them to reflect on where they are in life, set goals for what they want to achieve next in all areas of life, and identify the people who can support them.